Today was our second midwife appointment. My appointment was uneventful, but good. She said everything at the u/s was fine, and everything looks normal. I did lose a pound, so I have to go back in two weeks to be weighed again. They checked my urine for keytones (sp? )… I guess if you aren’t getting enough calories, you will burn your own fat, resulting in keytones in your urine. I didn’t have any keytones, so she said I’m eating well. She said unless I start vomiting, there’s no further steps to take for my m/s but wait it out. 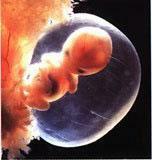 She also showed me a picture of an 8 week fetus ~ SO CUTE! (S)he has little arms and legs, fingers, toes, eyes…. I’ve found the photo on-line, and without permission from the photographer, Lennart Nilsson, I am sharing it with all of you. Anyhow, nothing too exciting at the appointment, just reassurance that all is well. Our next midwife appointment is February 28th, 2003 at 3:45 p.m. (PST) ~ we’ll post an update afterwards.